The award-winning enterprise AV management platform that makes configuring, managing and monitoring today’s AV installations, effortless and efficient. Turn raw data, room and device reports into easy to understand actionable intelligence. Instant access from anywhere with more tools to save you time. The Simplicity of a Single Solution. The Power of a Complete Platform. 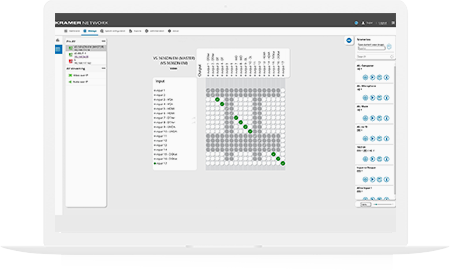 Kramer Network makes it easier than ever before to configure, manage and monitor entire Pro AV installations regardless of scale or scope. IT departments are being asked to do more with less, Kramer Network equips your team with a suite of tools to reduce onsite service calls, increase overall efficiency and help you deliver the level of service your clients expect. Faster simpler installations and easier ongoing support adds up to more satisfied clients. Kramer Network enterprise AV management platform helps integrators build and maintain relationships with current clients while providing an incredible added value to new ones. 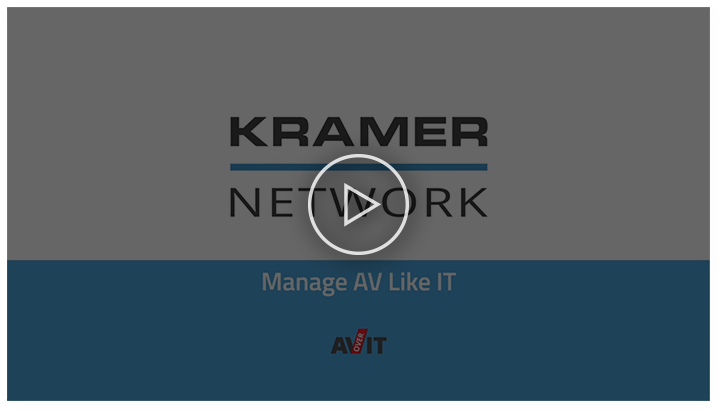 Kramer Network makes it easy for IT and AV professionals to manage firmware updates, monitor new and existing devices on your networks, and generate and share status reports with stakeholders. 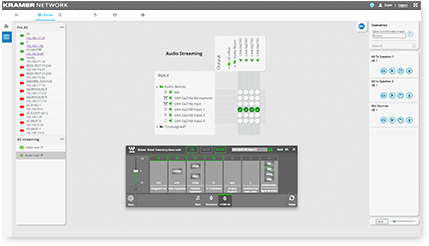 With auto device detection and no restrictions on the number of sources and destinations, administrators can effortlessly scale and stream high-quality audio and video to thousands of devices without having to invest resources on time-consuming IP network configuration. 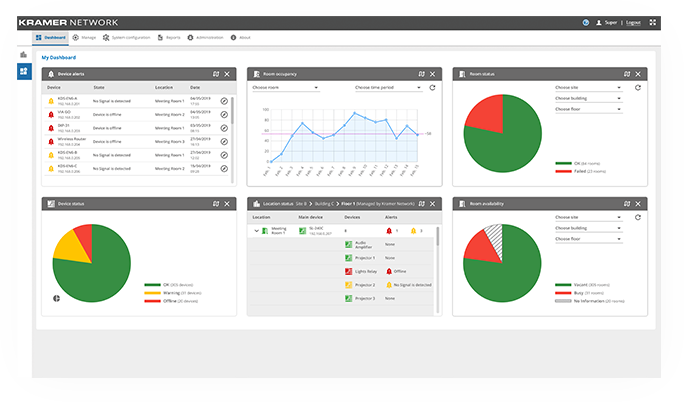 Remotely manage and monitor every room in your installation in real-time with Kramer Network’s intuitive Admin Room View interface. 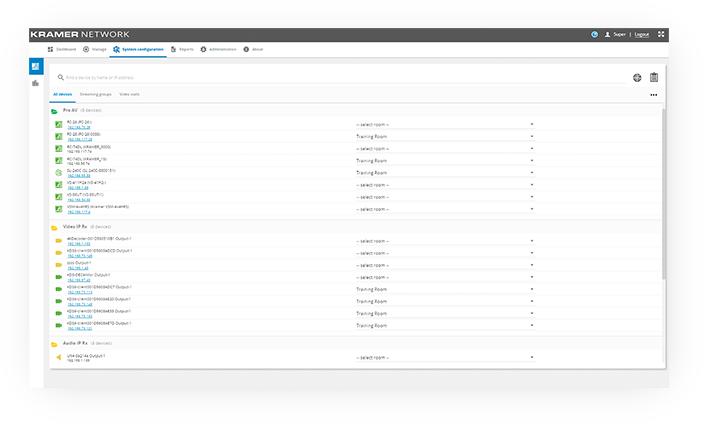 Accessible from any location in the network, administrators can view the status of every device in a room, trigger events, or activate preconfigured scenarios. 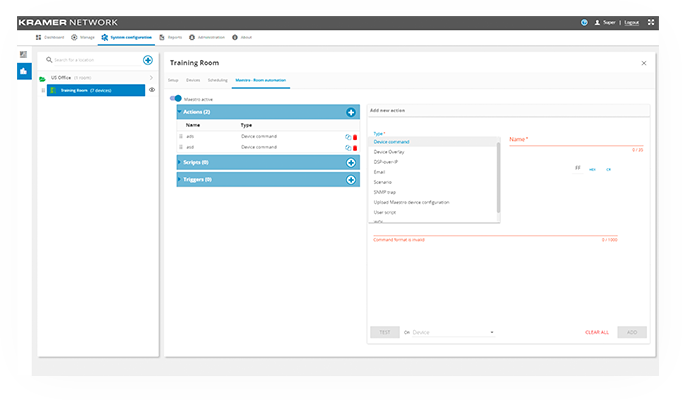 Admin Room View increases efficiency by drastically reducing the amount of unnecessary onsite service calls. 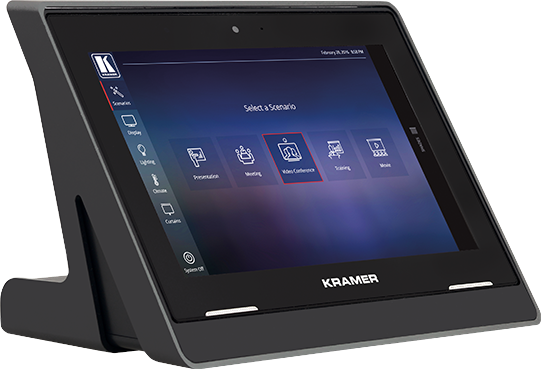 Setting up and running meetings with Kramer’s Maestro Room Automation is as simple as plug-in-and-begin. 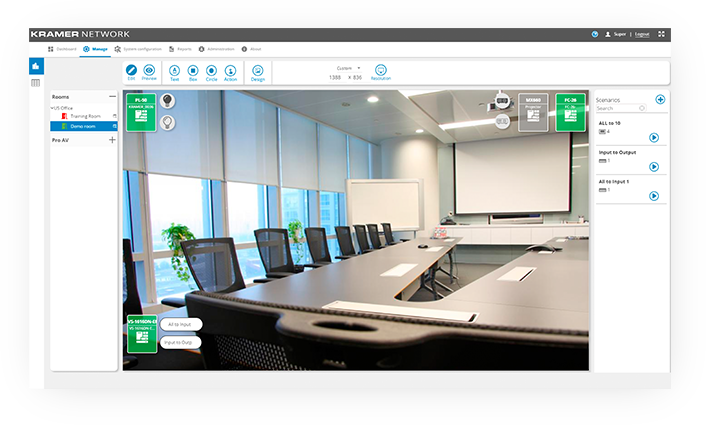 Kramer Network empowers administrators to manage and automate multiple meeting rooms easily with its user-friendly graphic UI. Automation scenarios are easily authored and edited, with no programming required. 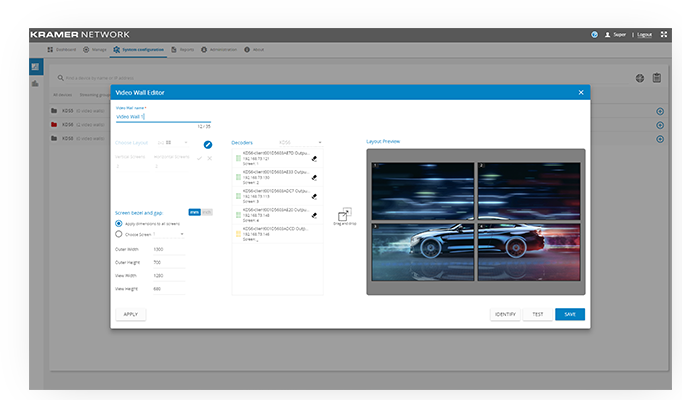 Administrators can use the video wall editor to select from a preconfigured layout or create a custom layout of their own, perfectly suited to any installation. 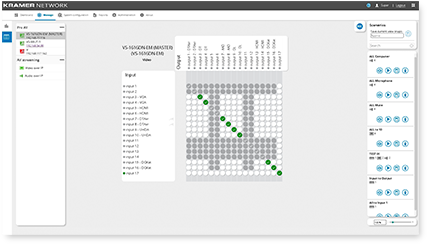 Kramer Network’s virtual matrix makes design, layout and routing of video walls simple and seamless. 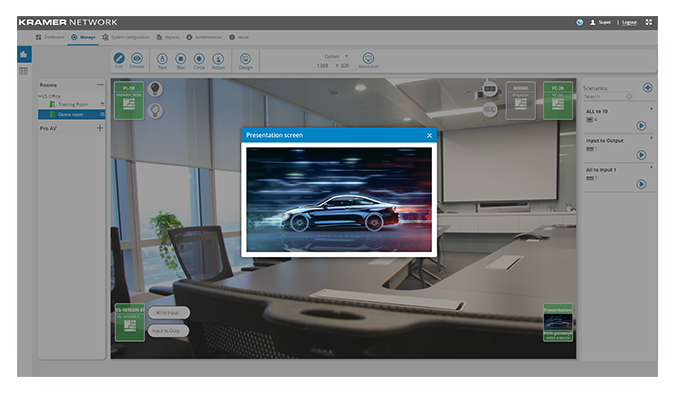 Kramer Maestro touchless room automation takes your video wall to the next level with customizable scenarios that can automatically trigger changes to your video wall layout just in time for that big presentation or the big game. Kramer Network's live video previews and intuitive color-coded device status notifications make managing your Pro AV easier than ever. Access Video Preview from Kramer Network’s Room View, Source Selection tool or the Video Wall Management page. It's now even easier to trigger predefined scenarios, adjust lighting, lower shades and turn up the temperature all from your sleek KT-107 touch panel. Kramer Network Dashboard turns your raw data into easy to understand actionable intelligence. 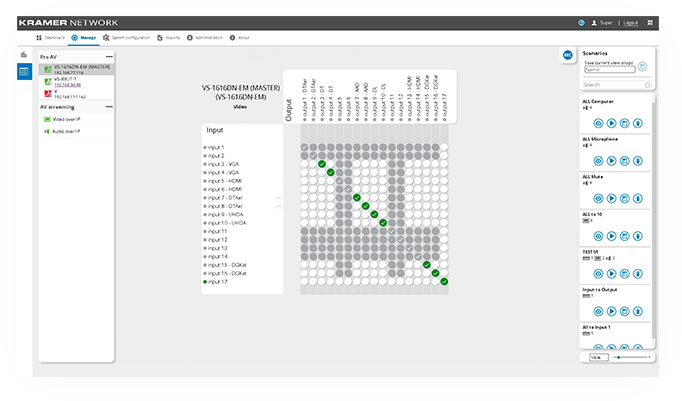 Pie-charts, graphs and sortable tables give you a real time read-out of room and devices status, occupancy and booking statistics and a centralized alert window. With thousands of customers around the globe and decades of experience in Pro AV, Kramer knows that every installation presents its own set of unique challenges. That’s why Kramer Network is offered in 3 convenient deployment configurations. Kramer Network Software can be installed on any laptop, dedicated server or virtual server giving you and your IT team the flexibility to create a solution that meets your specific need. Hit the ground running with Kramer Network Enterprise Management pre-installed on a single-box, plug-and-play server running 6th generation Intel® Xeon® E3-1240 v5 processors and Windows® 10 operating system. All of Kramer Network Enterprise Management functionality plus industry first DSP over IP, unparalleled Waves Audio™ processing of 64 simultaneous channels, and the jaw dropping routing capabilities of 1000 Dante™ I/Os. Curious about Kramer Network but not crazy about commitments? Get your free no obligation demo download and give it try! Problem seeing this form click here.